55.0 lb Hold Force: 1.250" (31.75mm) OD x 0.200" (5.08mm) ID with a 90° Countersink Hole x 0.300" (7.62mm) thick cap magnet / pot magnet. All dimensions +/- 0.5 mm tolerance. NOTE: All Holding Forces are approximate values. Actual Holding Forces will depend upon several factors....read below for more info. 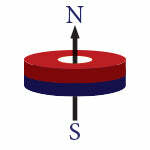 Magnet: Neodymium Ring Magnet, Grade N40, Nickel plated.